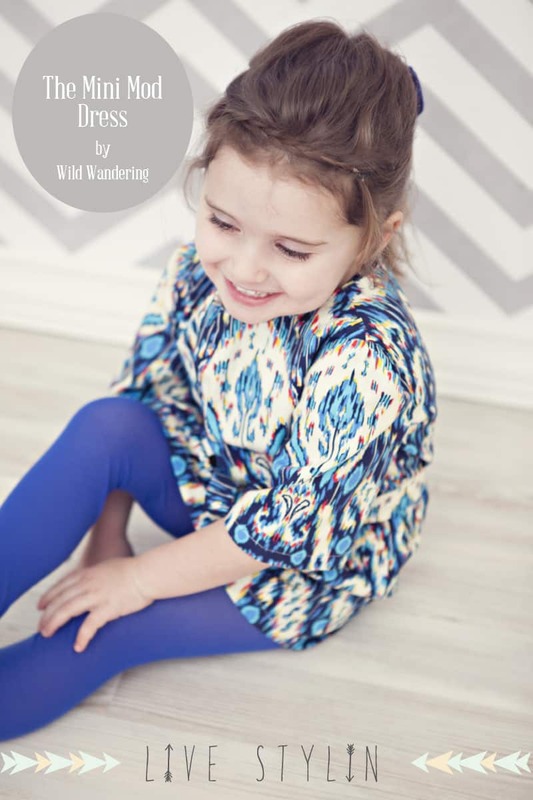 We’re kicking off Monday with the Mini Mod Dress Tutorial from Kelly at Wild Wandering. 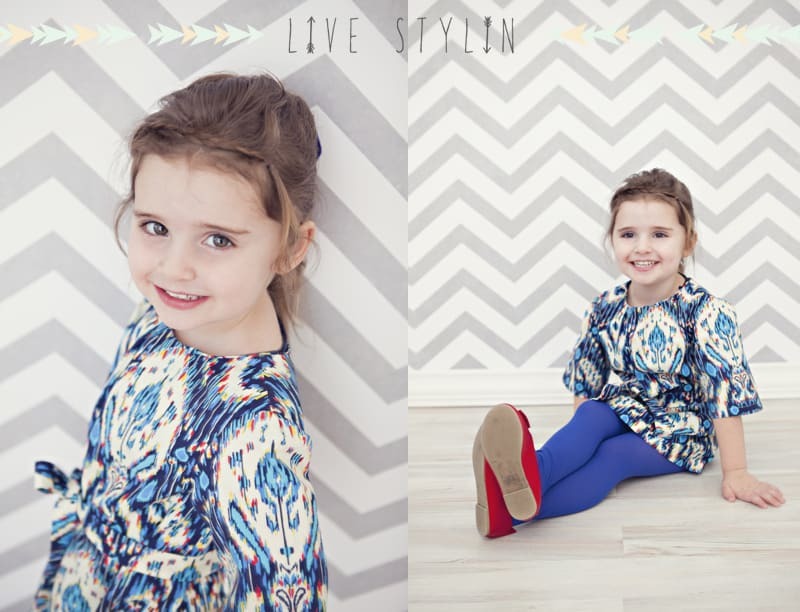 This cute number comes with a free pattern that you can customize for the perfect fit. Sew in elastic for a more fitted look, or lose the sleeves for hot summer days. Check out Kelly’s tutorials for bubble shorts for girls and a Papier Mache Deer Head for your home. Hear about her families many travels around the world and their adventures living in Paris here. Thank you oh thank you patient friends who have been waiting for this tutorial and pattern. I talked about it first when? In February? Oh how embarrassing. But now you know about the new blog and all that craziness so I am forgiven correct? 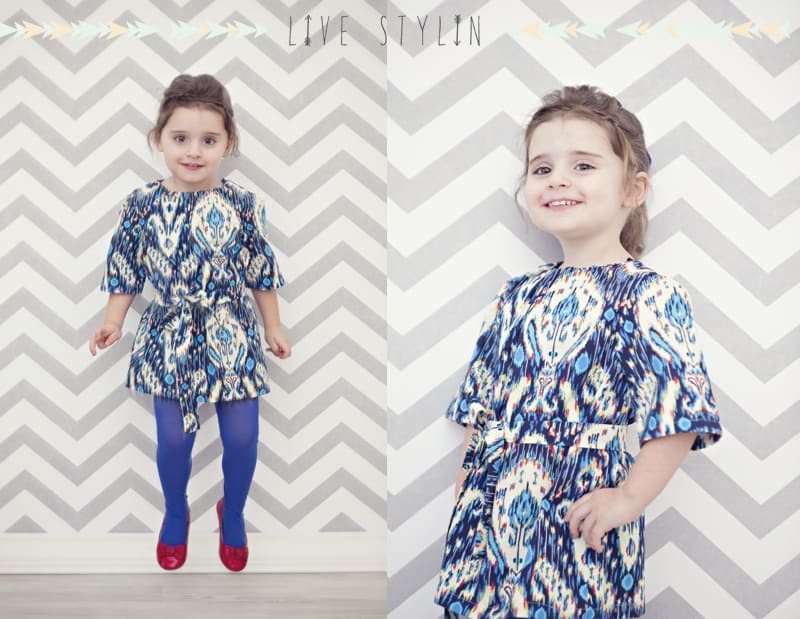 Here it finally is the Mod Dress tutorial and free downloadable pattern. I actually made this dress twice with two very different results just by changing the fabric and adding a bit of elastic to the sleeve. The first version is much more modern, with its boxy cut and square sleeves. The second version of this dress is a lot more “childish” and Springy. The fabric is from Ikea and is pretty stiff. I also gathered the sleeves with a bit of elastic and also (thought you can’t see it) gather the waist by top stitching a thing strip of elastic around the waist on the inside. I pull the elastic as I go with naturally gathers the fabric and gives the dress a bit more definition. I also feed some ribbon through the loops of her shoes because I am obsessed right now with THESE Dolly shoes. Poor Evie was FREEZING in London so I literally took maybe five minutes to take pictures of her. She is such a trooper and really just the best little girl when it comes to me dragging her out for pictures. None of my other cuties would put up with what she does. Don’t worry she got a Cadbury egg for her good behavior. 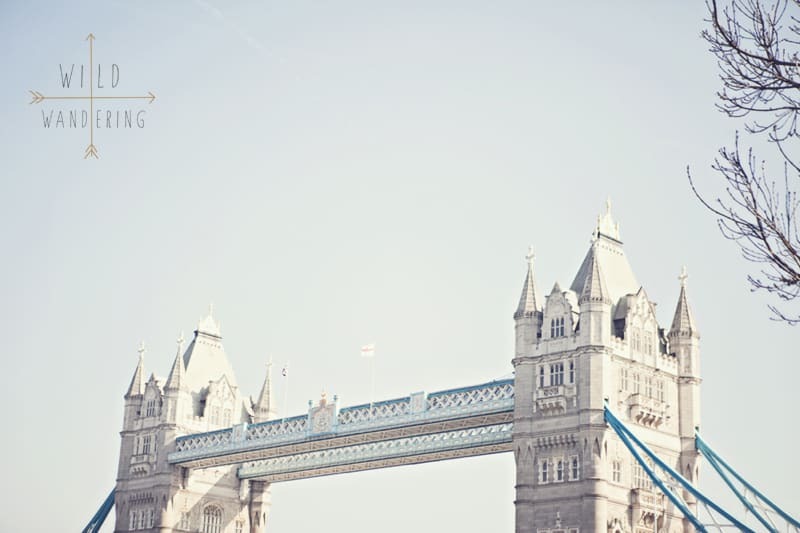 AND we got to walk admire the amazing Tower Bridge! This pattern is in Size 3T though I would say it runs small. I actually went to a ton of effort trying to “slash and spread” so that I could offer this pattern in more sizes. PLUS it is already a little short on Evie. It did not go so well. I have no idea what I did but when I made a sample in a larger size nothing added up. I have been toying with using a draw and move method instead. Has anyone done this? I would love to offer it in more sizes! For now the size 3T (though it would probably work as well as a 2T) is available right HERE for download. Now for the tutorial. You will need a yard and a half of fabric. 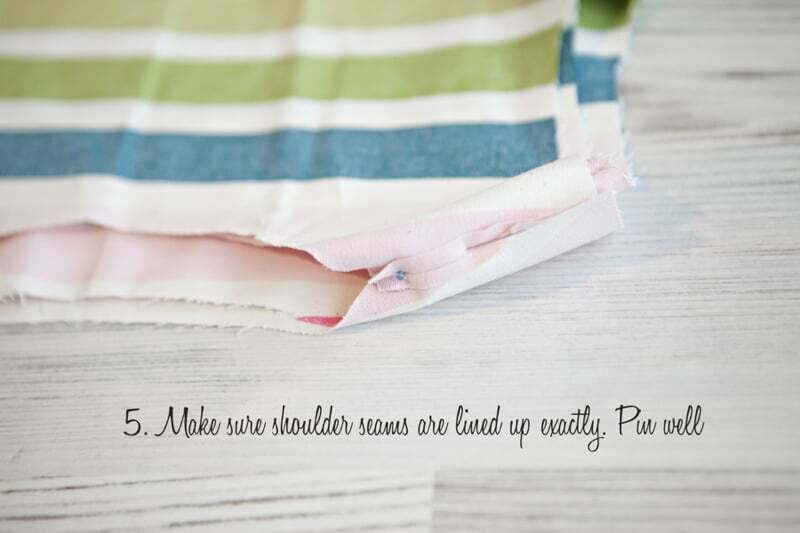 More if you have a patterned fabric that needs lining up. If you gather your sleeves you will need long thin elastic. Mine was tiny tiny thin and a pain to sew but it was what I had on hand. You will also need one button. After this step I also hemmed my sleeves. 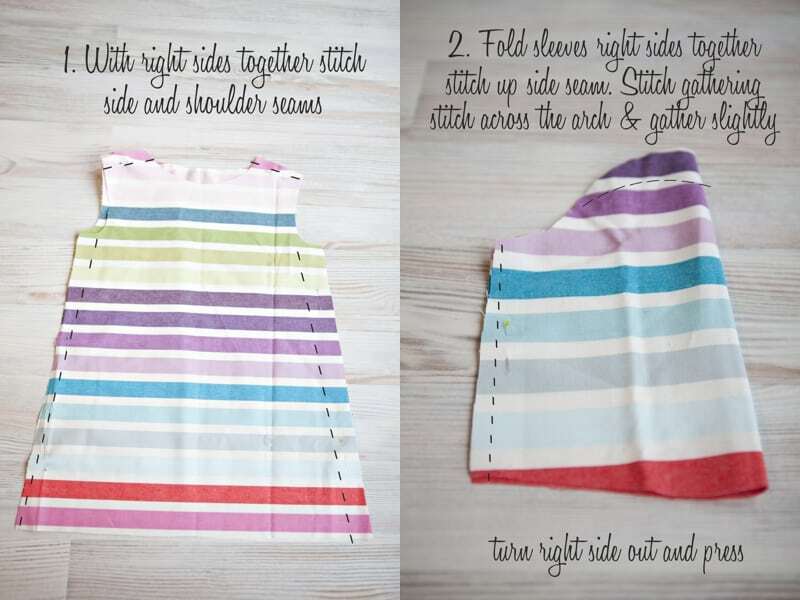 If you are gathering your sleeves now would be the best time to sew on the elastic. If not simply hem them. All that is left to go is hem the dress! 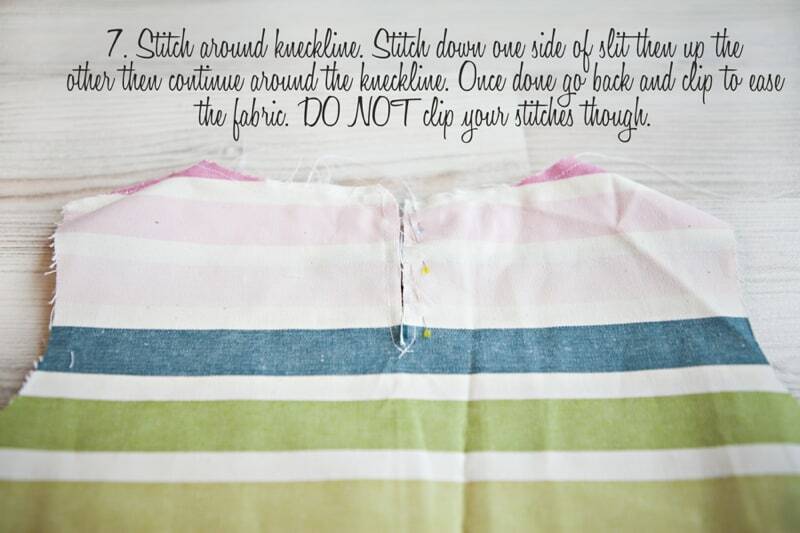 If you decide to add some elastic around the waist you can do that now. For both my belts I just took scrap fabric and sewed it together until I had a nice long chunky piece. I folded it in half lengthwise, right sides together and sewed up the side. I then flipped it right side out (with the help of a pencil) and tucked in the raw ends, finishing them off. Easy peasy! I would always love to see what you come up with! This is lovely. It will definitily be one of my next projects. Thank you so much! Oh no! I tried to download the pattern, but MediaFire told me I “did not have access to view this folder.” What am I doing wrong, ladies? My little girl so desperately wants to be mod! i got the same message and it won’t let me download it! Hello! I love your website! How do I get access to the pattern for this dress? The website you link doesn’t give access to your folder. Can you upload it on your server and post a link to it? Thank you! Same here! I would LOVE to make this dress, but I couldn’t access the pattern 🙁 Is it still available? any chance the pattern is available? like the others, i couldn’t access it! I just tried to download this pattern and it’s set to private 🙁 Is there any way I can access it?! It’s so adorable! Install another browser and give it a try. Don’t use Firefox. I tried to download as well…no luck. Any way to email pattern? I found the same when upsizing a pattern, until I realised that children grow heightwise more than girth, for a long time. That is why my daughter had frills put on the bottom of her dresses later, and my son fake fur on the bottom of his trousers, but that was a long time ago when children wore what was given them!! I was also unable to access the pattern which I would love to be able to make. Any hope? I am now told there is no pattern only tutorial so that may save time!!!! Love it!!! How can I access the pattern? I tried downloading this adorable dress pattern but it says that it is private. I’d love to make this for the little girls in my life! Please help! I too am trying to download this adorable dress but am unable to access it. It is offered on Freesewingpatterns.com with the link to here but something has gone wrong.